You had me at fallout shelter, but you lost me at little girl main character. I, like the majority of American cinephiles, am a sucker for post-apocalyptic/disaster/survival/bunker/humanity in a sample size films. The idea that we can look at what life might be like pared down or altered in a drastic, dystopic way is a fascinating one for so many of us, and we eat up any movie that takes on the topic, no matter how far-fetched the premise might actually be. In Hidden, we have a family in a shelter, surviving as they can, feeding us pieces of their back story one nugget at a time. And while the genre is wide open and this film does the back-against-the-wall concept justice, it never elevates itself above its roots, relies too heavy on one character, and fails to become something that stands alone, despite a twist that's at least an attempt at originality, if not an excellent one. For Ray, Claire, & Zoe, life exists only within a self-contained box underground. The family never steps outside, never talks about what's up top, and lives by a simple code of rules, including don't be loud, don't lose control, and don't talk about what might be in the world they left behind. Ray is an optimist who tries to make the best out of a bad situation, creating imaginary games, staying positive when negativity is all that seems left, and keeping a lookout through the night to keep his family safe. Claire is a little more pessimistic, missing the old days, fearing for her child's safety, and worrying about a future that might not include sunlight. And Zoe, their young daughter, grows up in world of no friends, no fun, and constant danger, becoming stunted by days & days underground with no idea what might be happening over the horizon. But how did this family find themselves in a fallout shelter, and why do they choose to stay there? Their story is almost unbelievable, and unfolds piece by piece as the balance of their lives begins to shift toward a possible forced emergence. We find out about a virus, a valley town, military presence, and creatures called Breathers that Ray is on constant watch for, that Claire is terrified of, and that Zoe has nightmares about. What are they, why are they here, will they ever leave, and is anyone alive out there? These questions will be answered all too soon, as the safe but enclosed existence that this family finds themselves a part of will come crashing down around them, exposing them to the dangers outside and to their worst fears. The set up is the best part of the film, and perhaps the only aspect that saves Hidden from complete obscurity. 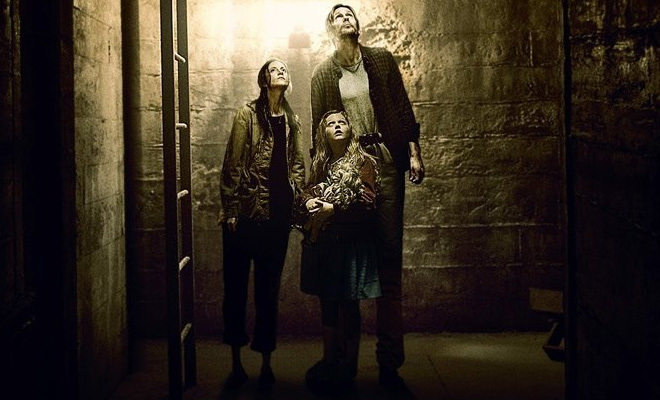 The plot begins with the family already underground, with the details of their past unfolding slowly, allowing audiences to get excited about the possibilities of their origins. As we learn little by little, we begin to understand more & more, even guessing at the twist, perhaps ruining the surprise, but always enjoying the game of what's what. Some might find that unique twist the best part of the film, but I'll stick with the groundwork of the genre; a bunker, some supplies, rules of survival, and the mistakes that lead to change. Those plot points have always intrigued me, and are enough to get my attention, hence watching this movie in the first place. Fans of the genre will find hooks here, at least at first, and perhaps that will be enough to hold you all the way to the end. Me, I wriggled free. After the initial fascination with the story and my desire to know the truth, I began to lose my interest in the characters. 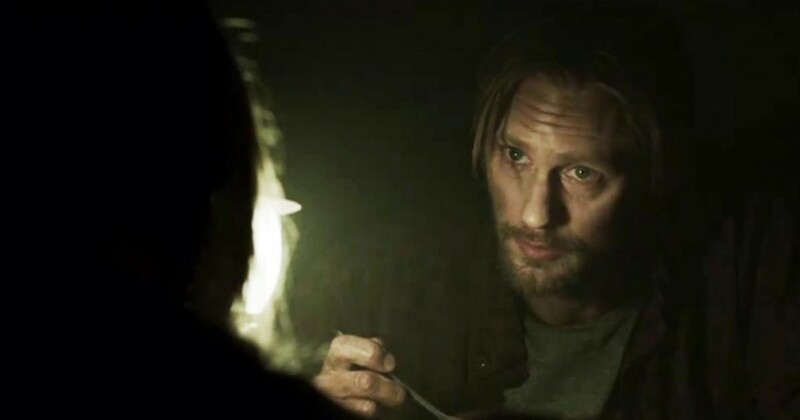 First, Zoe becomes the focal point, with Skarsgard & Riseborough playing her parents rather than defined individuals. Dad's the dreamer, Mom's the worrier, and Zoe is left to keep the emotion pointed in the right direct. Unfortunately, Lind isn't a great actress, at least not yet, and fails to become a compelling character; too bad since she's the lead. And when flashbacks start coming with increasing frequency, even the dark intrigue of the shelter is left behind, leaving us with a regular action flick with passable actors but without any magic. By the end, whatever had grabbed me at the beginning was long gone, and I was turned loose into a world I didn't care to be. Video: Done is Widescreen format, and presented in letterbox to preserve the scope of the original theatrical exhibition, the video quality of Hidden is forgettable at best. With muted color and dark scenes, the visuals are constructed to create a mood rather than to please the eye, leaving high picture quality behind and focusing on the frightening obscurity of the moment. Audio: With Dolby Digital 5.1 Surround sound, the DVD can be played using English language, French dubbing, plus one alternate option. Subtitles can be chosen from English, French, Spanish, and three other languages. The audio quality of the film is fine, with little in the way of impressive sound, but with a weight that can be felt throughout both the intense moments and the suffocatingly still. Rent It. For a film that promises much, Hidden delivers very little. The premise is an attractive one; a family living in fear, an undefined evil outside, limited resources, no hope for the future, a catalyst that will cause dangerous change. But the manufacturing of that story leaves much to be desired. The film focuses on the little girl too much, leaving her more-talented parents behind. And when the main bunker story was left in the dust as well, the entire film suffered, unable to continue in the strong vein with which it began. The video quality is low, the audio not much better, and there aren't any special features on the disc. So if this is a genre that you're a fan of, that piques your interest very easily, that ropes you in against your better judgement, then you might want to consider giving this movie a wide berth; it won't give you what you're looking for.